Wouldn’t it be nice if dinner was already made when you came home from work or wherever? My son was looking for something warm and hearty that he could heat up quickly after a long day at work. 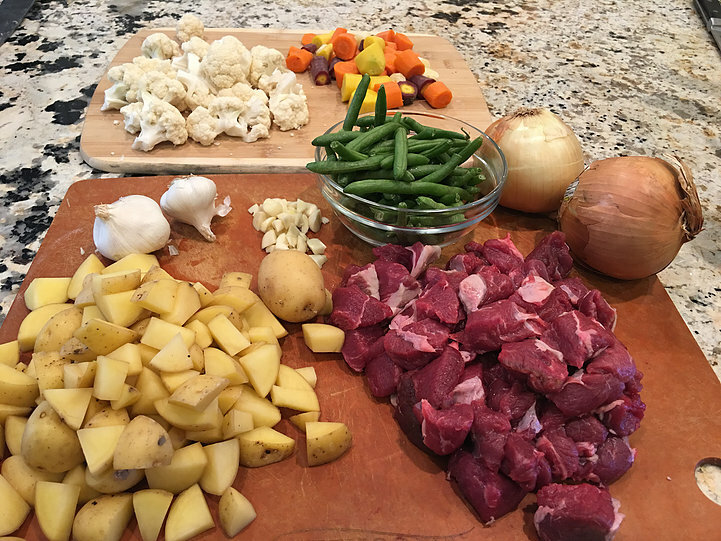 This lamb stew was the answer. You can make it once and have several meals. This home-cooked meal goes a long way and it’s pretty simple to make. Watch us make this together! All the work is in the chopping. Find a helper… one of your kids, your spouse, partner or call a friend, and have them help you chop. It makes meal prep fun, it goes quicker, and it gives you time to catch up. Don’t be surprised if you laugh a little, find some deep moments, or learn something new about your assistant. Also know that you are teaching them how to cook — a life skill that is essential for a healthy life. Look at all that goodness! All those fresh organic veggies! If these aren’t your favorites, pick something you like better. I thought about asparagus instead of string beans or sweet potatoes instead of the yukon gold. Make it your own. That’s half the fun! While this is simmering, you get the added bonus of the amazing smell of deliciousness in your kitchen. You won’t have to call anyone for dinner. They will start showing up! 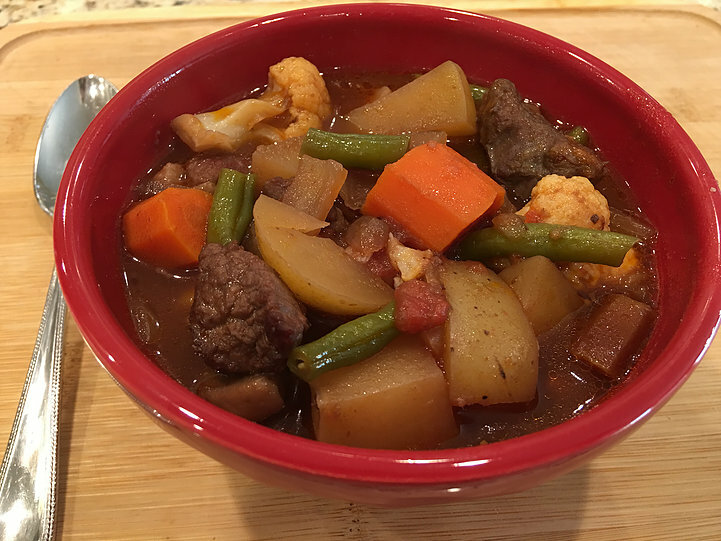 This stew is so delicious, you will want to drink every last drop. Homey and hearty, it is like love in a bowl. Season the lamb pieces generously with salt and pepper. Heat 2 tbs. of olive oil in a big soup pot. Sauté mushrooms for a few minutes until they turn golden. Remove to a large bowl. Add another 2 tbs. of olive oil to the pot. Sauté the onions and garlic, stirring occasionally, until they turn golden brown, about 10 minutes. Remove from pot and add to the bowl with mushrooms. Add 2 tbs. of olive oil to the pot (yes more, but it is a healthy fat). Add the lamb to the pot. Add more oil if the lamb sticks to the bottom of the pot. Sprinkle lamb with flour. Stir to coat. Cook, stirring occasionally, until the lamb is nicely browned and the liquid is evaporated, about 10 minutes. Remove lamb to the bowl with the mushrooms and onions. 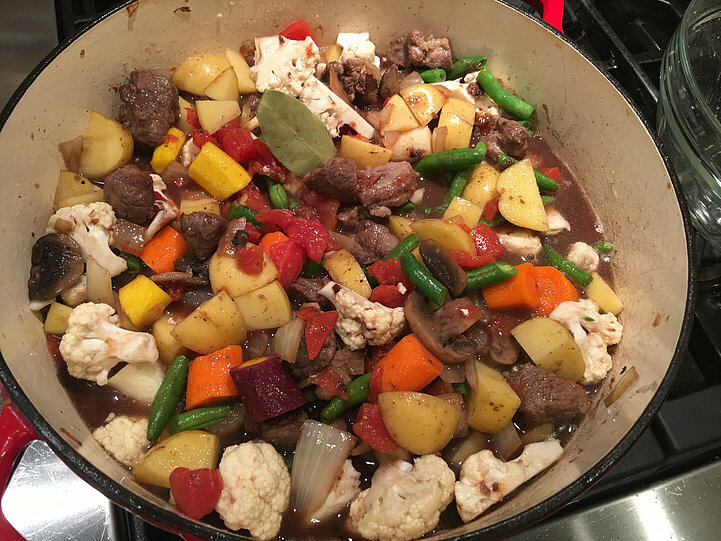 Add red wine to the pot, scraping up the browned bits on the bottom of the pan. 1-2 minutes. Add the bowl with the onions, mushrooms, and meat back to the pot. 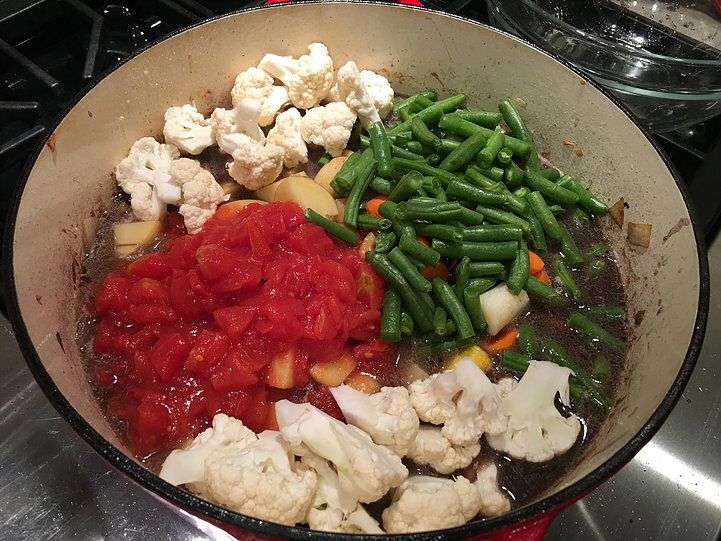 Add the remaining ingredients, diced tomatoes, tomato paste, green beans, cauliflower, potatoes, bay leaves, thyme, and beef stock to the pot. Bring to a simmer. Cover the pot and cook on low for 45 minutes. Add salt and pepper to taste. Spoon into bowls.